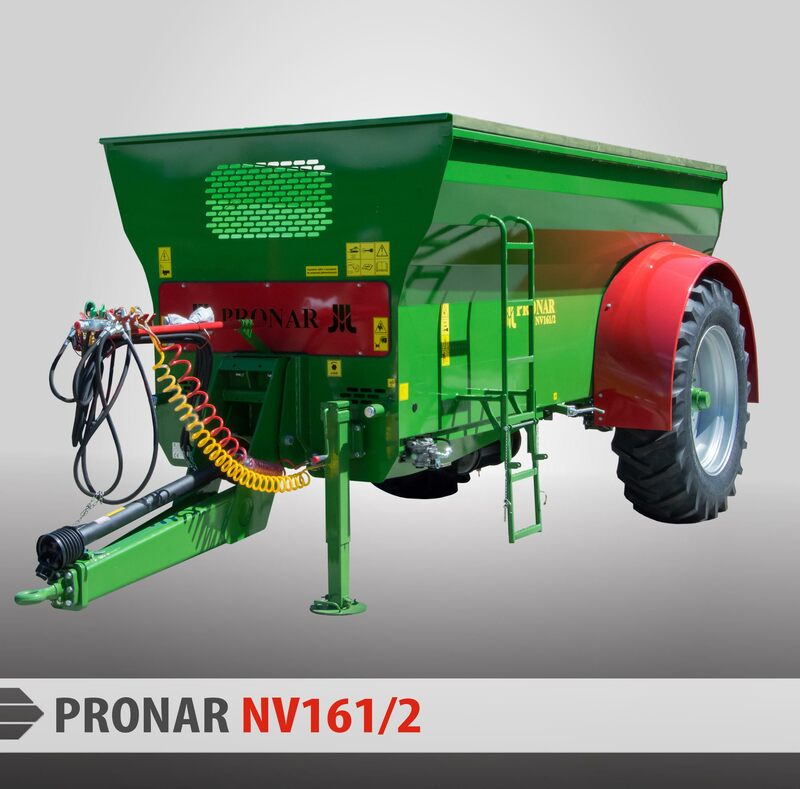 Manure spreader PRONAR NV161 series 1/2/3/4/5 - Pronar Sp. z o.o. 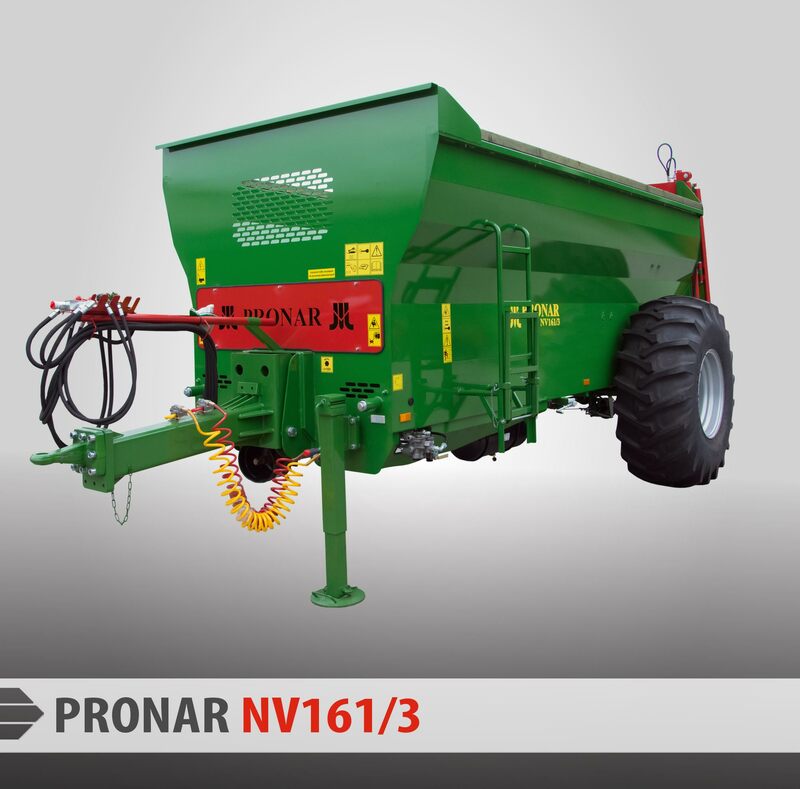 Manure spreaders PRONAR NV161/1/2/3/4/5 series are designed for precise and uniform spreading of manure, peat or compost. 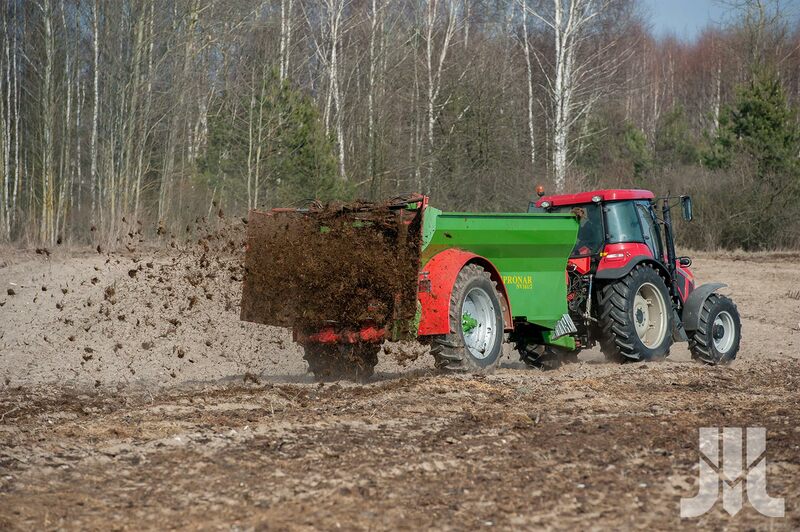 Manure spreaders NV series are powerful, robust and rugged machines, the use of which provides an ideal and effective fertilization. 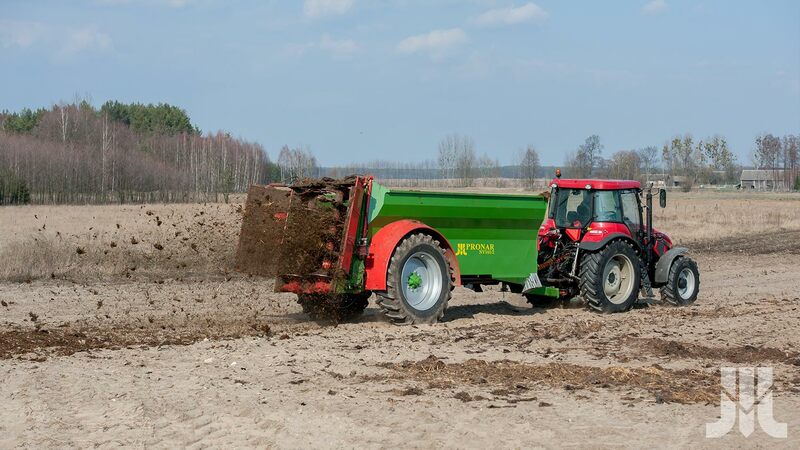 They have the optimum capacity of 8.6 m3 to 14,4m3 what makes manure spreaders NV161 series, the perfect solution for both small and large farms. 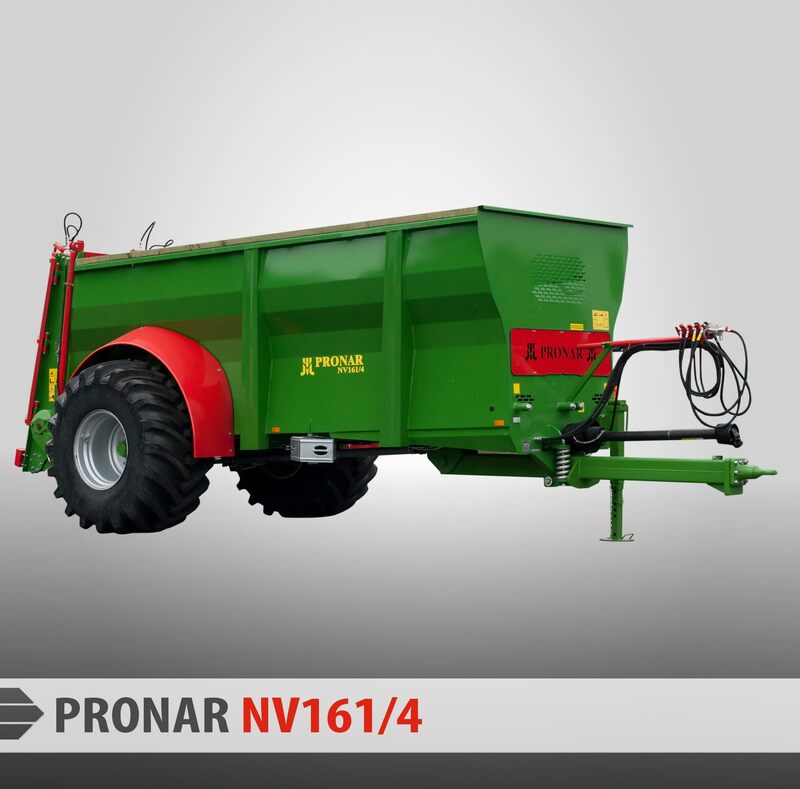 Manure spreaders series NV161/1/2/3/4/5 are equipped with carrying body of 4mm thickness. The walls of the body are made of one profiled sheet. The shape of the body – similar to the letter “Y” prevents from blocking the sliding of the material during work. 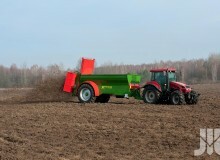 Carrying capacity of manure spreader depends on the model range and varies from 8.6 m3 to 14,4m3. 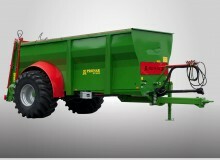 Adjustment of the amount of dosed material is held by the floor speed controller, placed at the front of the trailer. Smooth and stepless adjustment of the conveyor floor speed is possible at both standing and working position what provides a constant move of the cargo. 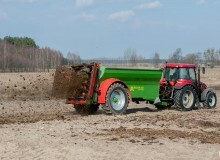 In manure spreaders series NV161 tension of the floor chains is mechanically regulated by the use of screws placed at the front of the trailer so that the tension can be verified from the tractor’s cab. 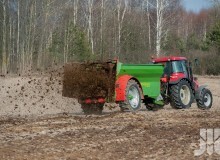 In all models of manure spreader series NV161 single-axle suspension is used what makes them easy to maneuver. 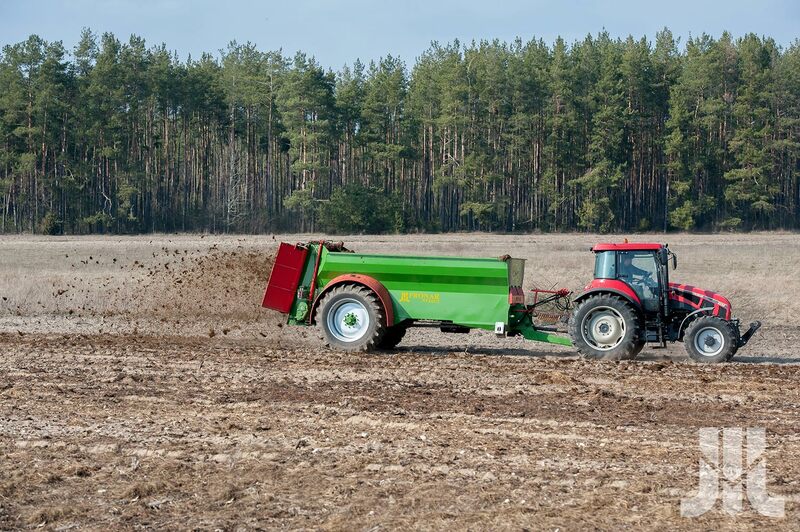 In addition, the tractor wheels are properly weighted what allows to increase their pulling power and manure spreaders less interfere with the ground. 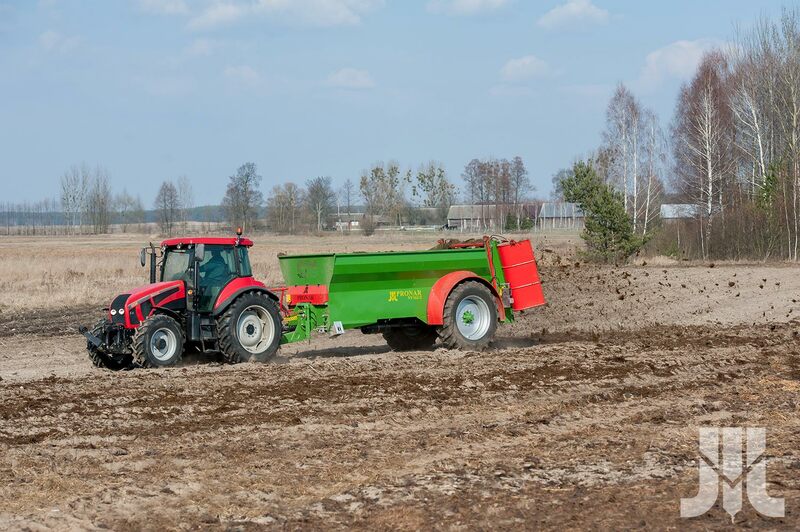 In manure spreaders series NV161, large diameter of tyres was used, so that the pressure on the ground is small and better distributed. 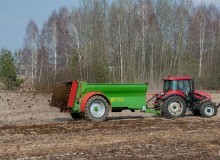 As a result, formed ruts are shallow and tyres adjust better to the ground structure. 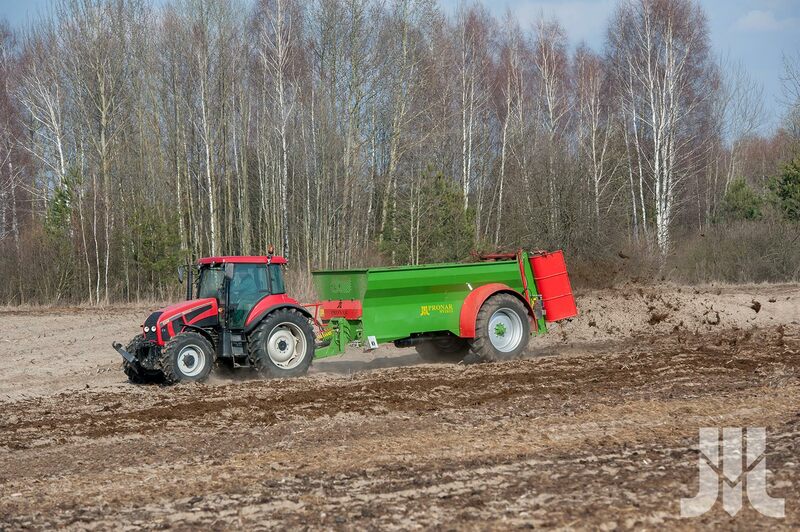 An additional advantage of the use of the high wheels is the ease of driving even on wet and muddy terrain. 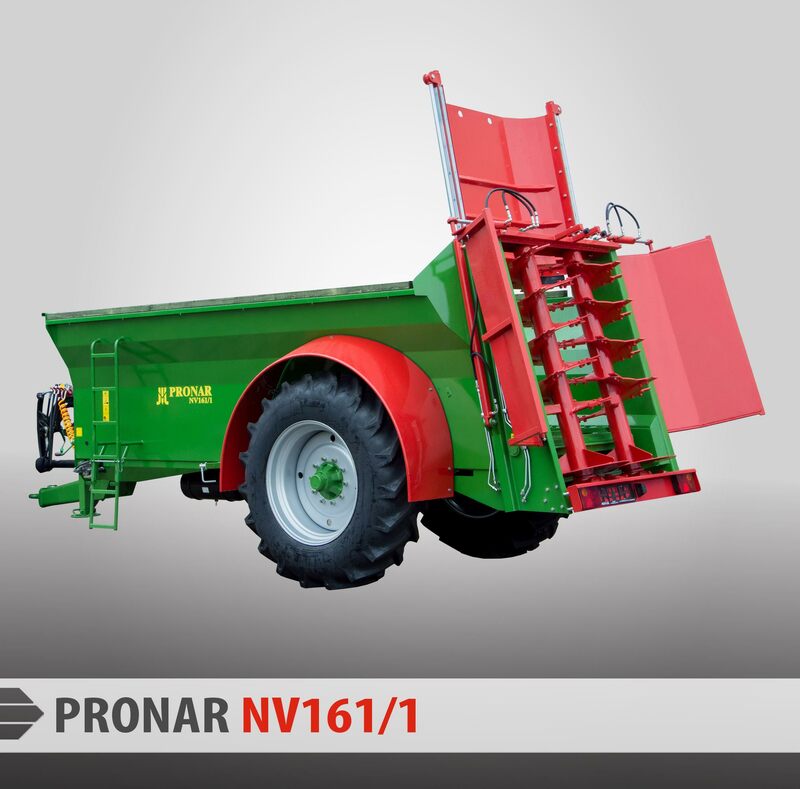 All models of manure spreader series NV161 are equipped with 2 vertical beaters what guarantees precise spreading of approx. 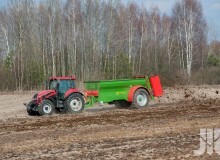 12 m with maximum throughput. Adapter blades perfectly shred the material and distribute it evenly. 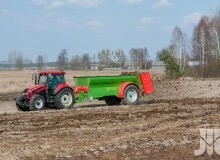 Adapter is powered by the PTO speed of 540 rmp . 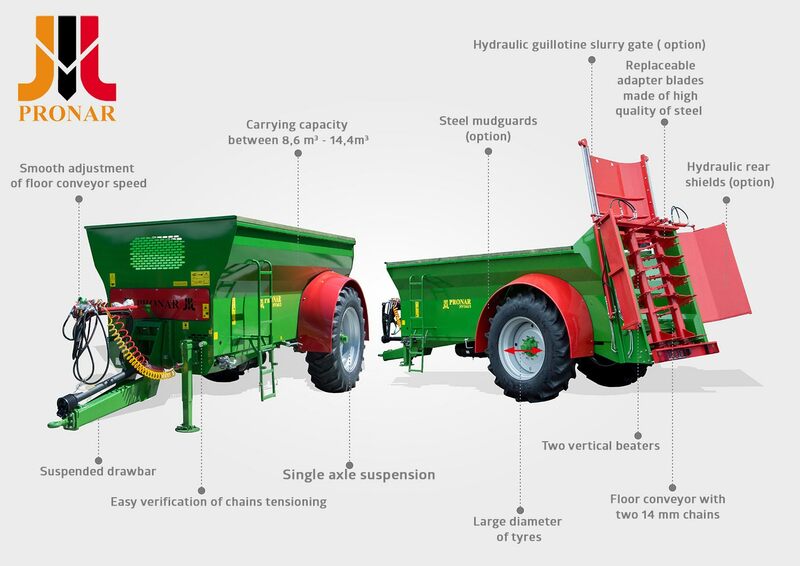 In manure spreaders series NV161 chain conveyor with two 14 mm roller chains made from high quality steel was use. Conveyor chain is hydraulically driven and equipped with stepless adjustment of the material speed. The large diameter of tensile sprockets reduces chain wear and increases their lifetime. 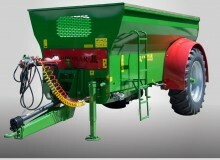 Large chains affect on durability and low wear. 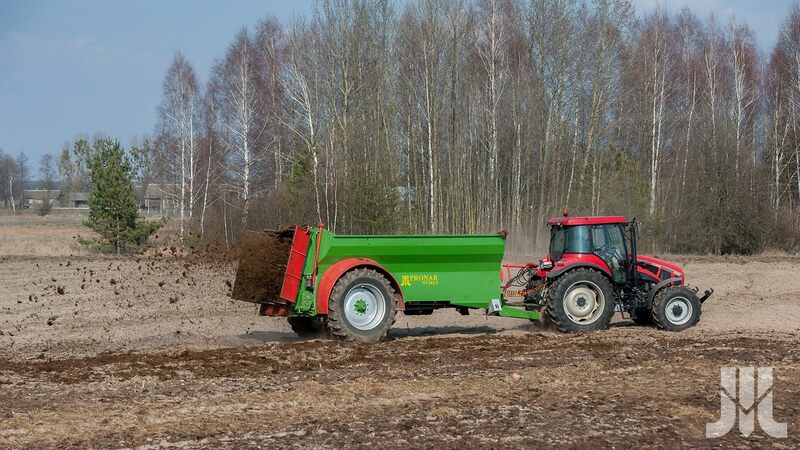 Manure spreaders are equipped in single-line lubrication system of front sprockets what facilitates their operation and maintenance. 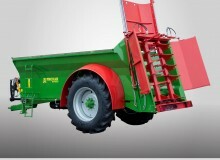 Screwed adapter blades made from high quality of steel guarantee long use of the trailer, and are very easy to replace. 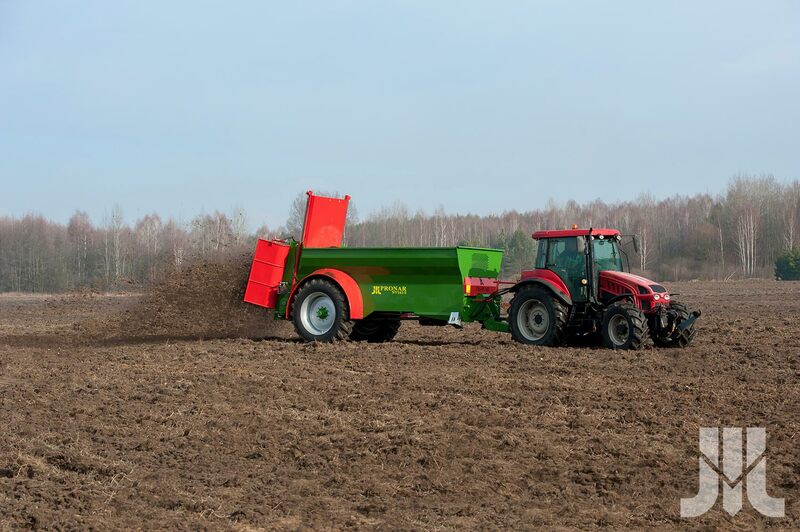 Mounted as an option, hydraulically operated two-winged rear shield allows to set the spreading width and the spreading edge on the field or near water. Closed shields protect the material against spilling during transportation. Shields adjustment is done by means of valves which position can be set freely depending on the needs. As optional, manure spreader can be equipped with a hydraulic slurry gate that secures the spreading adapter from the pressure of transported mass and prevents from falling the mass onto the road. 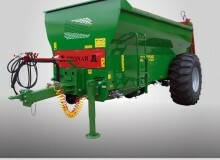 In extreme cases slurry gate can be used as a dosing gate, provided that the max. 20 cm space from the bottom is left. Recommended with full tonnage.